Over the last decade research has been showing us that periodontal disease (also known as gum disease) is a far greater threat to our overall health than we once thought. In fact, studies show that periodontal disease contributes to the development of heart disease, the nation’s #1 cause of death. gums that are tender when touched. Periodontal disease has been recognized by our government as a higher risk factor for stroke and heart disease than high cholesterol. It has also been linked to premature or underweight births and can increase the risk of pulmonary diseases, like chronic obstructive pulmonary disease (COPD). It has also been shown to influence more common ailments, ranging from diarrhea to headaches. As an integral part of our regular practice, our Santa Monica dental team will monitor the health of your gums, including a simple and pain-free check for bone loss and bleeding points. We routinely perform a non-invasive oral cancer screening and temporomandibular exam to ascertain joint health. General dentist Dr. Ana Brightleaf believes that maintaining good oral health is easier & far less costly than having to cure an illness or deal with a preventable condition. 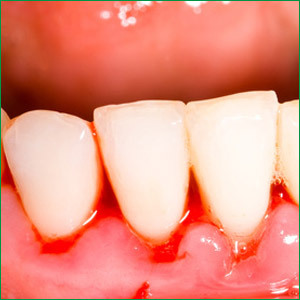 We can advise you on how to avoid periodontal disease and treat you if you already have signs of it. A program of regularly scheduled cleanings in our office is a first-line defense against periodontal disease. Health professionals who understand that a team approach to your health care are the ones who are best positioned to help you look after your overall health. You can consider us a key partner in assuring that you are in feeling and looking your best. Brightleaf Dental serves patients in Culver City, Brentwood, Santa Monica, Pacific Palisades, Beverly Hills CA and surrounding communities. Contact us for a complimentary consultation.